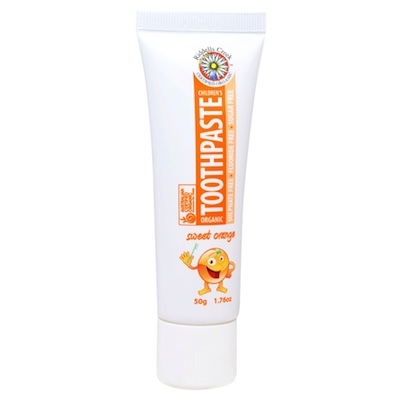 Sulphate, fluoride & sugar free, this certified organic childrenâs toothpaste is formulated with a blend of herbal extracts and calcium carbonate to gently clean teeth. Sulphate, fluoride & sugar-free, this certified organic childrenâs toothpaste is formulated with a blend of herbal extracts and calcium carbonate to gently clean teeth. Sweetened with tooth-friendly Stevia, with delicious orange flavour kids will love. This toothpaste is free from synthetic chemicals, colours, and preservatives. Organic Aloe Vera Juice, Organic Glycerin, Purified Water, Xanthan Gum, Silica Powder, Organic Sweet Orange Essential Oil, Parfum, Organic Saponified Coconut Oil & Organic Saponified Olive Oil, Sodium Bicarbonate, Calcium Carbonate, Soapwort Extract, Celtic Sea Salt, Organic Olive Leaf Extract, Parsley Extract, Peppermint Extract, Organic Rosemary Extract, Sage Extract, Thyme Extract.